Having never met him, I can still see him so clearly. He is wearing a dark suit, arms folded. One hand clinched together under his chin. His smile is sincere but not overwhelming, and above his head are words like “Purpose”, “Vision”, “Kingdom” and “Prayer”. Bookcovers. That is how I learned of Myles Munroe. As a child, my four siblings and I were so accustomed to seeing books authored by Myles Munroe all around our house. Dr. Munroe’s books would be laying on the dashboard in my father’s car, covering his side of the dresser, nestled in his work bag, beside his cup of coffee, tucked in his brief case on Sundays, placed on top of the hamper in my parent’s bathroom, bundled on the dining room table, or sometimes wedged between the cushions of the couch. We, along with people all over the world, grew up on the teachings of Myles Munroe. Whether he was expounding upon purpose, destiny, globalism, colonization, government, relationships or the Kingdom of God, after listening to his messages or reading his books, you felt aware of yourself and you felt better about yourself. His words could convict and console, explain and encourage, reveal and rebuke. Our room grew silent, but in my heart I continued to yell, “no” and in my mind, the questions began. How could Dr. Myles Munroe, his wife Ruth, and several members of their leadership team be dead? Where was God in this tragedy? How could he allow so many important men and women to die so early and suddenly in their careers? Could this be an attack of the enemy? Could this really be God’s plan? What about his son? His daughter? What about his church? Surely, it wasn’t his time. Who can teach the Kingdom like Myles Munroe? There must be a mistake. It couldn’t be their time. Could it? Unless the seed dies. A seed unless it dies is just a seed. However, a seed that is planted in the ground, grows and brings forth much fruit and even more seeds. There it was in plain sight. Dr. Munroe expected “to see millions..” He “longed to see a generation…” He desired to see more fruit. The ultimate result of his life was not the production of books and audio messages. The ultimate result of his life was to produce fruit and the only way to produce fruit is for a seed to die and be buried in the ground. The books, the messages, were merely seeds–seeds buried in people just like me and my family who lived in a small, rural town in North Carolina. A place completely opposite of the Bahamas, yet a place where seeds had been deposited. I imagine Dr. Munroe was like a dandelion plant. 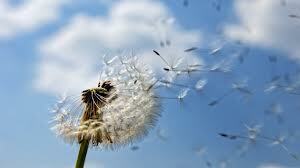 The seeds of a dandelion plant travel with the help of the wind. Guided also by the dandelion seed’s natural wing design these tiny, fragile units can flow through storms, across valleys and even across mountain tops. Throughout his travels, tiny, feather-like seeds, were blown off of him and deposited all over the world in the Caribbean, the Middle East, Asia, Africa, India, Europe, North and South America. Eventually, there were no more seeds left for the wind to carry. The plane crash which initially looked like his greatest tragedy, became his greatest triumph. Through his death, he will bring forth much fruit. Thank you for your commitment to die empty. Thank you for pouring yourself out. Thank you, Dr. Myles Munroe.